Cupid, Texas is a town created by legends woven around the stalagmite in the shape of the arrow-shooting son of Venus discovered in a cavern near the town. During the post-Civil War era, a prayer to Cupid saved a charming rogue charged as a horse thief from hanging when one of the town’s spinsters married him; a letter left at the feet of the image gave Millie Greenwood, the heroine’s great-grandmother an HEA against all odds; and this Cupid’s powers even played a role in the abdication of Edward VIII. Later, the town placed a Cupid statue fountain in the botanical gardens with an official “Letters to Cupid” box, and visitors seeking help from Cupid made tourism the town’s major industry. Part of the tradition involves the female descendants of Millie Greenwood writing answers to Cupid’s letters. As the eldest daughter of the eldest daughter of the eldest daughter in a direct line from Millie, Natalie McCleary bears a particular responsibility. That role added to the tragic loss of her parents that what she feels is a charge from them to care for her younger sister Zoey. As the owner of a B & B, she has obligations to her guests. Natalie is defined by the responsibilities she bears. Her responsibilities and the injury she suffered in the plane crash that killed her parents have limited her life. At 29, she is less experienced than many women a decade younger. Although she has had a few boyfriends, she is essentially untouched physically and emotionally by passion. In fact, she is beginning to doubt her ability to answer Cupid’s letters, to give advice on love when she has never been in love. Although she is surrounded by extended family and friends who love her, Natalie is fundamentally lonely. Dade Vega is a rough, tough former Navy SEAL who comes to Cupid after he receives a text from Red Daggett, his foster brother and closest friend, signaling him that he needs help. With a history of neglect and abuse and independence at an early age, Dade is wary of people. Red is the only person he trusts, and Red has disappeared. Dade knows that it’s possible that Red had a PTSD episode, neglected to take his medications, and is lying dead somewhere, but his instincts tell him there’s something rotten in wholesome Cupid. Dade plans to investigate until he finds some answers, and then he plans to leave town. He’s not cut out for community and relationships and the kind of connected life that is common in Cupid. Just one look and all the mysteries of the universe were answered. Every nerve ending in her body tingled to life as if she’d been asleep for a hundred years and was awakening for the very first time. Dade is just as frightened because he knows how much he wants this, how different these feelings are from anything he has ever known, but he feels unworthy of love. Honestly, he was half hoping that she was a hallucination because that would rightly explain the berserk push-pull between his head and his heart. He felt a rushing need to go after her, spill his guts, tell her who he was and how he felt. One look in her enigmatic sky blue eyes and he felt as if love beckoned him with open arms, while his soul had dug in its heels and jerked back, too guilty of damage and sin to believe anything so good could be true. Both Natalie and Dade will have to replace fear with trust in themselves and in one another before they can accept the love they want, the union they need. 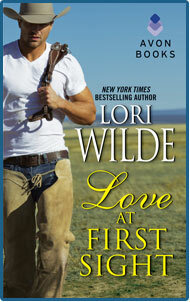 Love at First Sight is the first book in Lori Wilde’s third Texas series, following her Twilight Club books and her Jubilee cowboy novels. Readers who liked the Twilight, Texas stories will enjoy a visit to Cupid. There is the same focus on legend and the traditions that spring up around it, the same small-town ambience, the same tangled family connections and quirky characters. Natalie and Dade are likeable, and they are surprisingly complex. It is easy to root for them to find their HEA together. Although their lives have been very different, they are both among the walking wounded, misfits who never quite belong to the groups that define them—her family and community for Natalie and the SEALs for Dade. A couple of scenes between them (the bar and the shoes scenes) are as poignant as they are steamy. Despite all the things I liked about the book, there were a few things that kept it from being the book I felt it could have been. First, I would like to have seen less mental lusting and more real development of the relationship. These are two people with complicated histories, and I wanted to see more of their working out those complications. I have a low tolerance for repetitions of “He/She is so hot. I want him/her so much.” The second problem is related to the first. I’m a tough sale when it comes to love at first sight. Attraction I can buy, and I know there was supposed to be something mystical and destined about Cupid’s strike in this town, but it took me to the end before I really believed that Natalie and Dade felt more than a strong sexual attraction. Finally, I really disliked Natalie’s sister. She impressed me as a spoiled, self-centered brat, and I thought she was mean to Natalie. Some of her actions seemed more the behavior of a sixteen-year-old than a twenty-two-year-old. I look for her to be the heroine of a later book, but it will be an uphill battle for me to see her as heroine material. In summary, I recommend this one, but with some reservations. Thanks for the review. I love Lori's books. I have this book on my kindle already.. Can't wait to read it. Lori is on my fav list of authors that are must buys..